Cleveland’s lakefront is getting new attention from Mayor Frank Jackson. CLEVELAND, Ohio — The development of Cleveland’s lakefront is a century-old story of piecemeal action and broken promises, but Mayor Frank Jackson thinks he has strategy that could put all that in the past. The plan, drafted by EE&K architects of New York and Van Auken Akins Architects of Cleveland, could unfold over many years and eventually reach $2 billion in value. Most of the money is expected to come from the private sector. Skepticism came quickly at the City Hall news conference, not only from reporters but from John Onacila, a 67-year-old boater who lives on the city’s West Side. From the rear of the room, he listened as proponents declared this plan to be The One. “I’ve heard that before,” Onacila whispered. 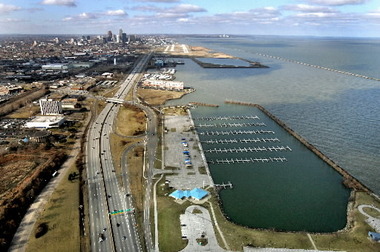 But Jackson and others say the latest vision can become reality because it has the backing of the Cleveland-Cuyahoga County Port Authority, the Cleveland Browns and other lakefront interests and answers two lingering questions. Will the port move? Will the airport close? In both cases the answer is no. Another key is a series of ordinances, given to the council Monday night, that make clear which sections of the development area the city will control, and which will be managed by the Browns or the port authority. Council President Martin J. Sweeney said the council should pass the legislation by February. He and downtown Councilman Joe Cimperman said they are excited about seeing mixed-use waterfront development become a reality. 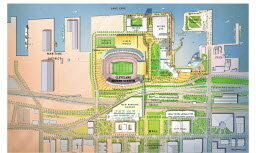 The city, which owns all of the development area, will lease land to developers, just as it does with the Browns. Chris Warren, Jackson’s chief of regional development, expects some developers to commit to projects within six months, though financing and other hurdles could push construction out two or three years. When other publicly financed features will arrive is not as certain. 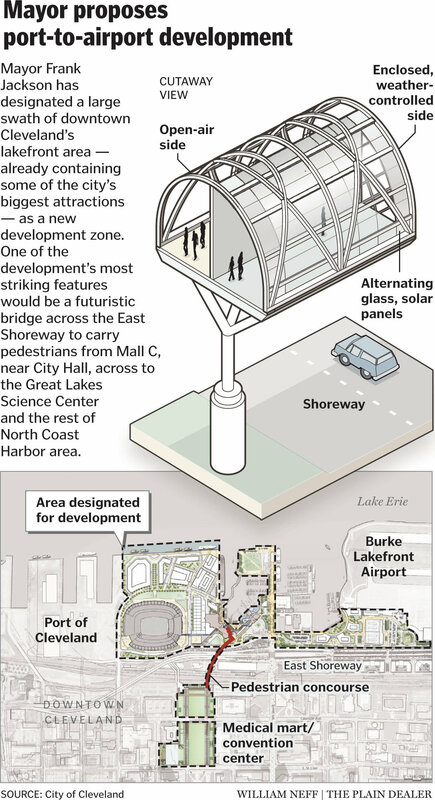 The city needs $100 million for other work, including a second pedestrian bridge linking the lakefront to downtown. Cleveland has asked the federal government to pay $80 million of that expense. Skeptics can be forgiven. A number of grand plans for the lakefront have been floated over the years; Jackson’s is just the latest. A 1959 plan called for a recreation center with a sports arena and aquarium. In the 1960s and 1970s, proponents pushed for an international jetport five miles offshore, along with new parks, beaches and marinas. In 2000, then-Mayor Michael R. White proposed a $750 million plan that included a Ferris wheel, children’s museum, band shell, theater complex, aquarium, ferry dock and marina for pleasure boats. Four years later, his successor, Jane Campbell called for five marinas, five beaches, 3.9 million square feet of office and commercial space and 7,500 housing units. Planners also spoke about building an 18-hole golf course and turning Burke Lakefront Airport into mixed-use development.